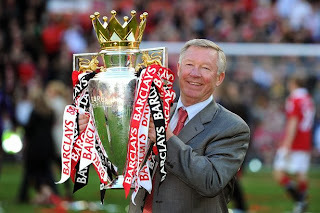 www.leegunnell.com: Saluting Sir Alex Ferguson: (From an Arsenal Fan). Saluting Sir Alex Ferguson: (From an Arsenal Fan). "A sight I always hated, but now appreciate"
Growing up with the blood of Arsenal flowing through my veins, I hated Alex Ferguson. I hated his dull Scottish tones and emotionless expression, malicious public attitude towards adversaries like Arsene Wenger and Rafael Benitez, the extended periods of injury time at Old Trafford he seemed to bully referees into, and his incessant moaning about every decision made against his club. Take a look back at the most successful managers of history; Ottmar Hitzfeld, Jose Mourinho, Brian Clough, Pep Guardiola, and the like. At points they have all managed sides which dominated world football. And yet, these periods of victory tend to have been in short bursts of genius; sandwiched between spells of lingering slightly below peak levels. This isn’t a criticism of the giants of management - far from it, it is merely an indication of the talent Ferguson possessed, that I cannot think of anybody else who maintained his level for over two decades; especially in a world as fierce and competitive as the English Premier League. In that period he saw off the challenges of Leeds, Liverpool, Blackburn, Newcastle, Arsenal, Chelsea, and Manchester City; all top quality sides with an eye on the throne of England's kingpin. Not only this, but as an average player has a shelf life of two decades maximum, created at least five completely different squads; each as unbeatable as the last. Even the few major final defeats or slip ups in the league, were always by mere inches. And only now he has retired, do I feel his achievements can receive the true retrospective credit they deserve; at least outside of Manchester, anyway. The current struggles of Manchester United and David Moyes, are not as much an indication of his lack of ability as a manager, as much as they are a reminder of how close to perfection Ferguson was. Now as a mature adult, I can see how his emotionless expressions were a way to protect the club from the negative media circus which hinders young, impressionable professional minds. How his attitude towards other managers was a means to gain psychological advantage once on the pitch, and the moaning and bullying, just part of the nature of a Scotsmen hardened by the merciless streets of Govan. Ferguson played the game at the very highest level, and at that level - while you need passion, humility, and determination, you also need to be a little ruthlessly Machiavellian in parts; and the man was a true artisan in the art of war. As much as it pains me to admit, Alex Ferguson will go down as the greatest football manager in its history. The closest to him was arguably Liverpool hero Bob Paisley, but he succeed in an age devoid of the pressures of millionaire footballers, mass-media obsession, and a wider entry of opinion coming from every conceivable angle. Ferguson was, in many respects, a man who reached the peak of a hill and stayed there, until he decided to come back down; regardless of the many who tried to knock him off. And even though I hated seeing every last Manchester United trophy lift; and trust me, I really hated seeing Manchester United win as a kid, I damn sure respected the effort it took to secure that success. Woah, awesome..I am a man utd supporter and people like you made me proud as a football fan. No matter what club we are supporting, in the end it's what football is all about. Passion, love, loyalty, disappointment, cheer and RESPECT.